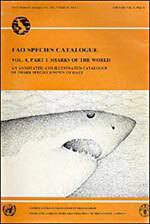 Dr. Leonard Compagno is the author of two volumes of shark catalogues published in 1984 by the Food and Agriculture Organization (FAO) of the United Nations. These volumes, used extensively by shark scholars worldwide, are out of print. 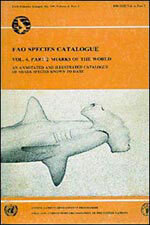 FAO also published a few synoptic volumes of marine species important to humans, including marine mammals, sea turtles, and many on different groups of fishes. -- John F. Morrissey, in an email on March 31, 1998. Photos courtesy of Jim Craig who owns this well-thumbed set.